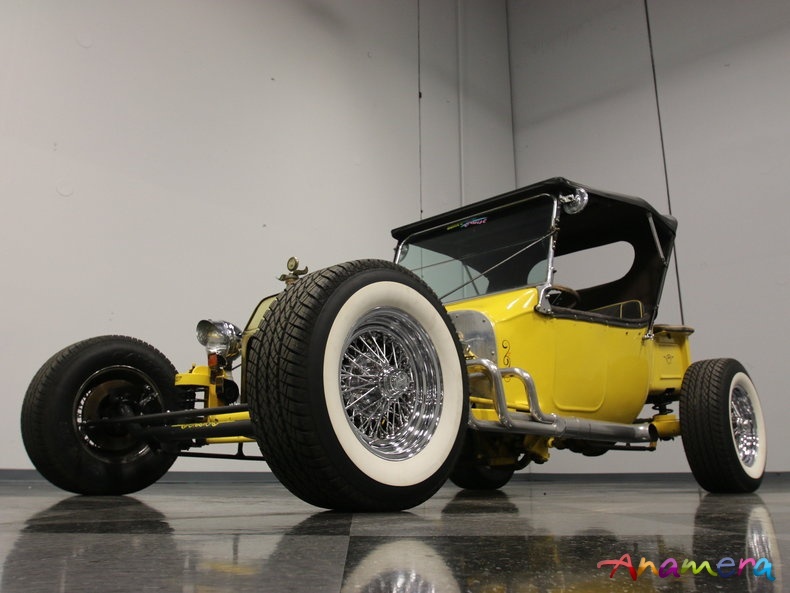 A lot of folks thought the day of the T-bucket was over, but recent strong sales (we've sold several in the past few months) suggest that everything old is new again. 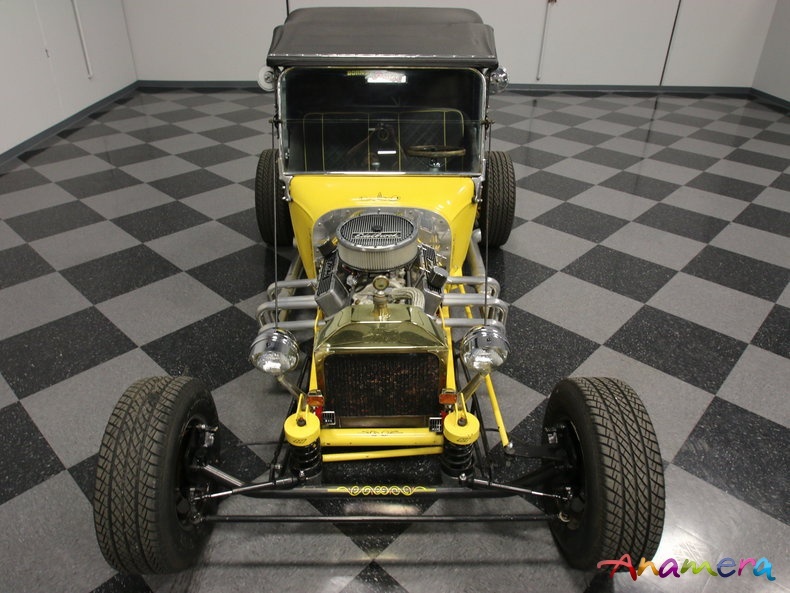 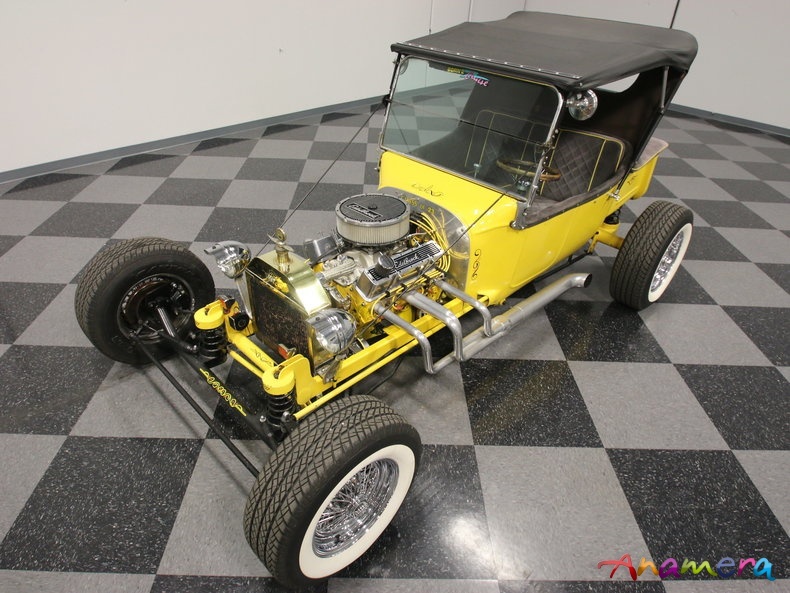 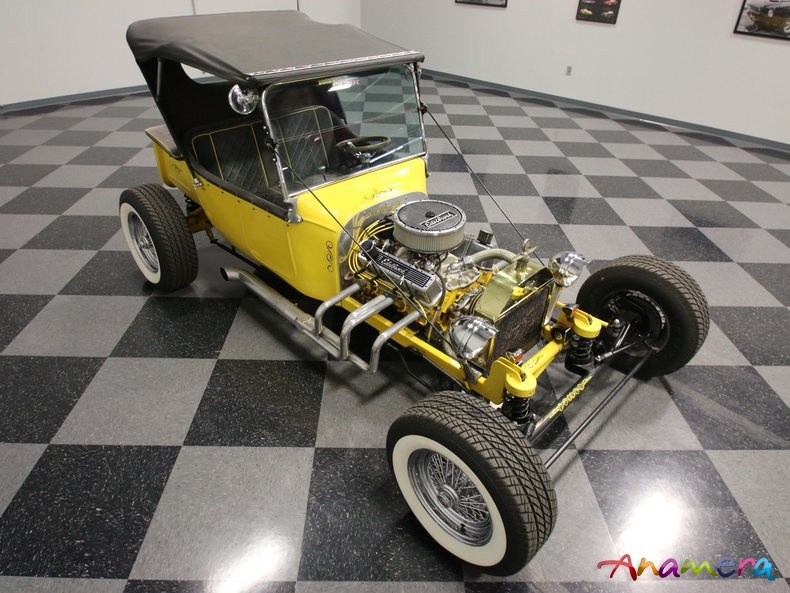 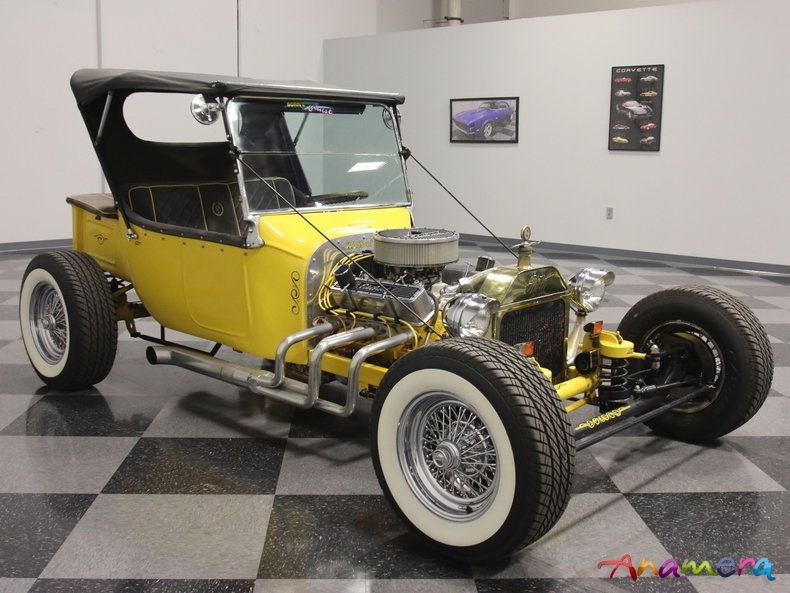 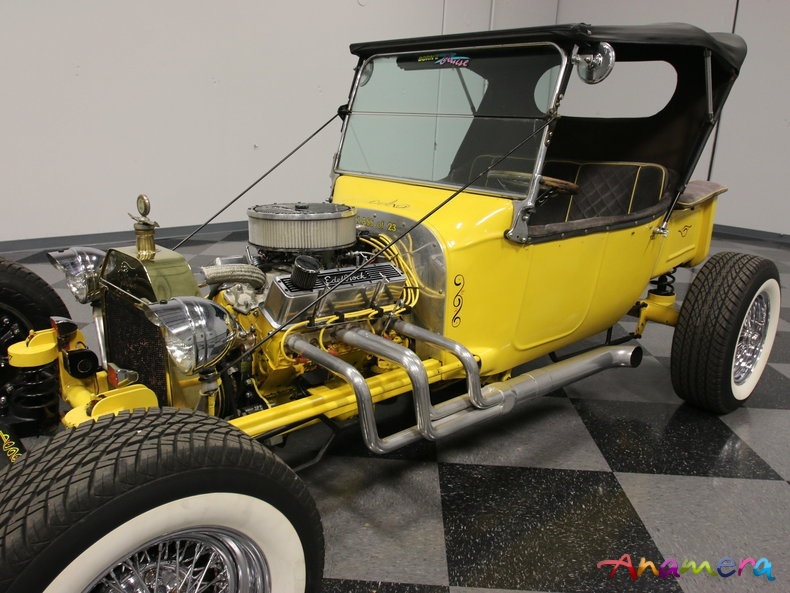 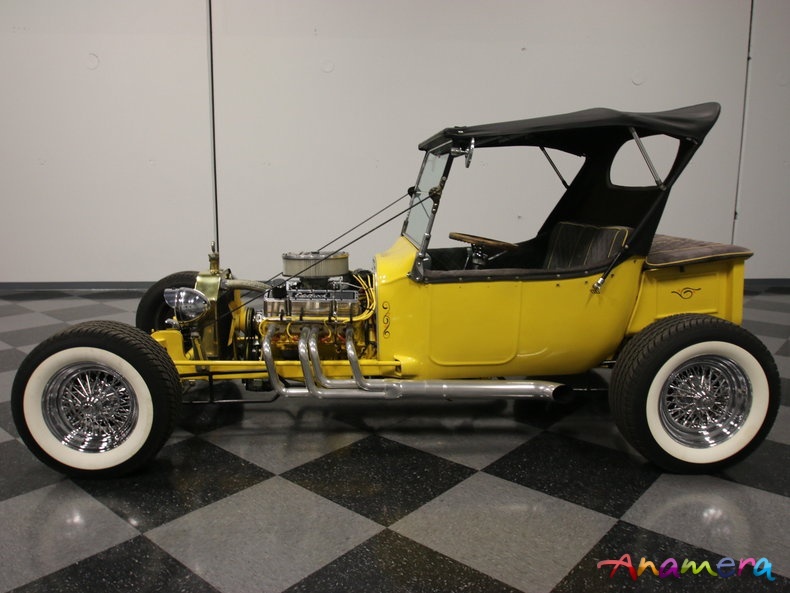 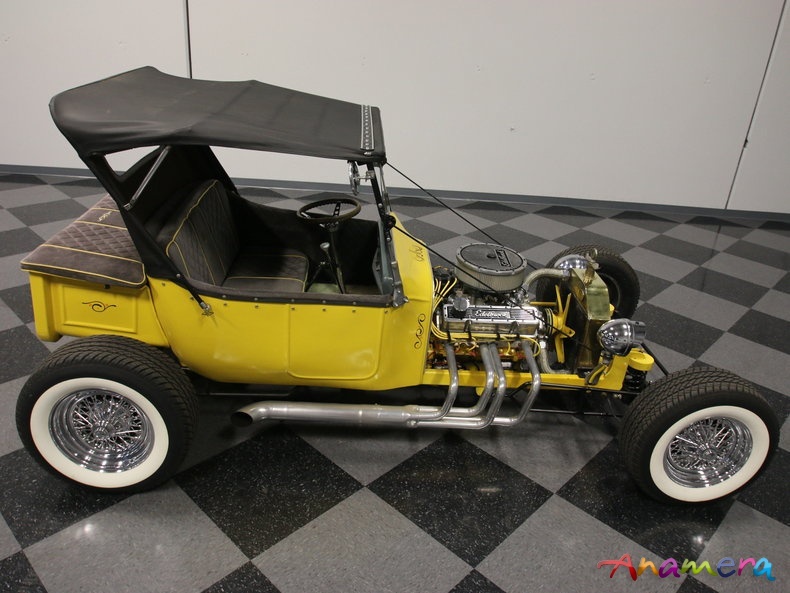 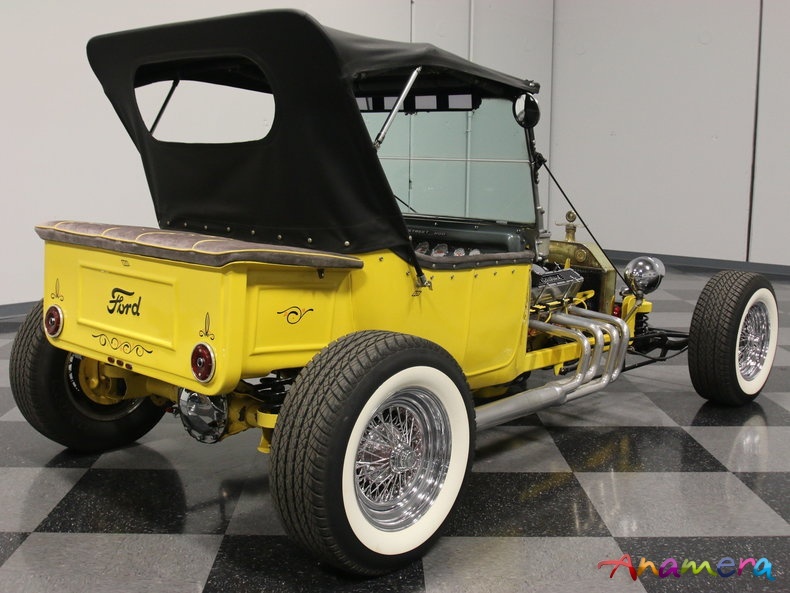 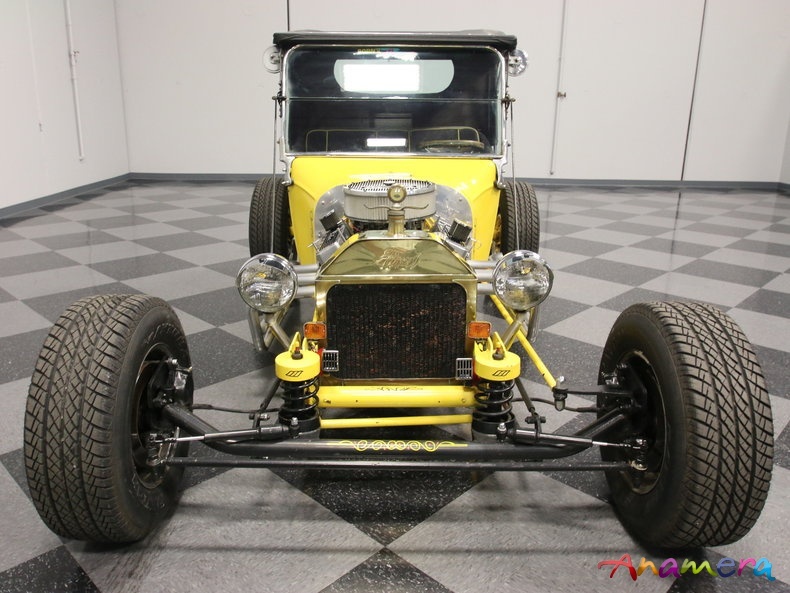 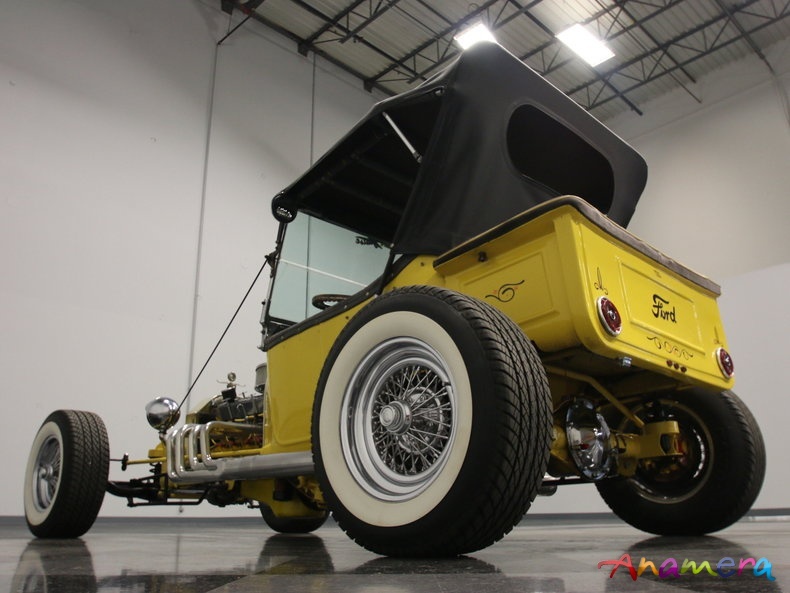 This particular 1923 Ford T-bucket nails the look and the feel, combining the classic truncated Model T pickup body with a smooth-running Chevy V8 powerplant up front. 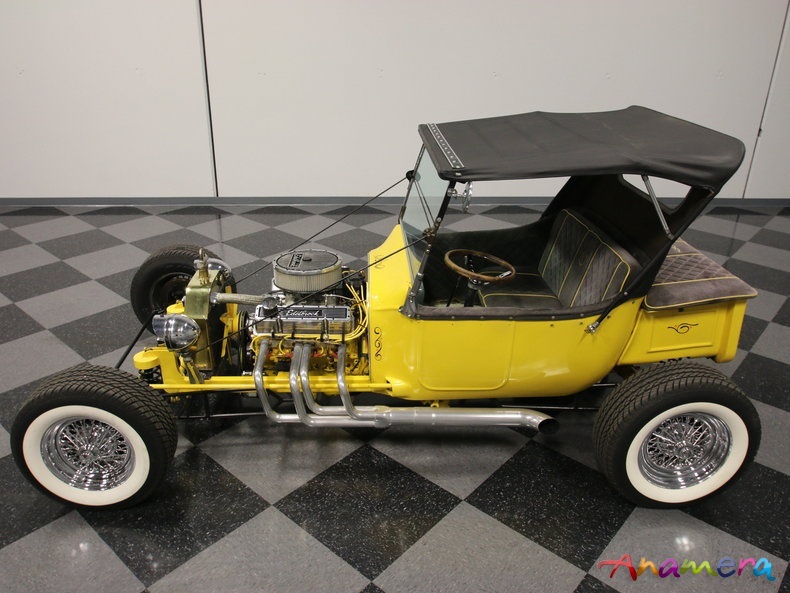 If you're doing a T-bucket, you need to go full retro with it. 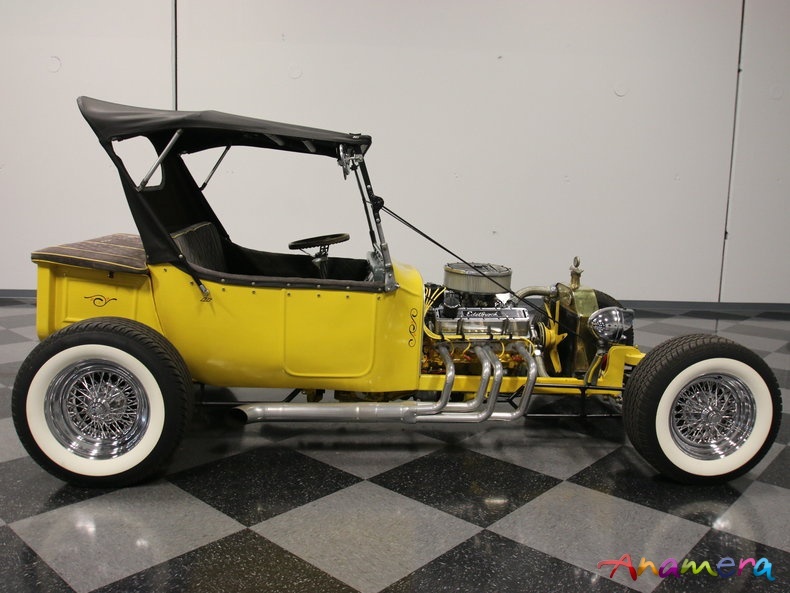 That means wild paint, plenty of pinstripes, and a top that looks like it was penned by the Ratfink himself. 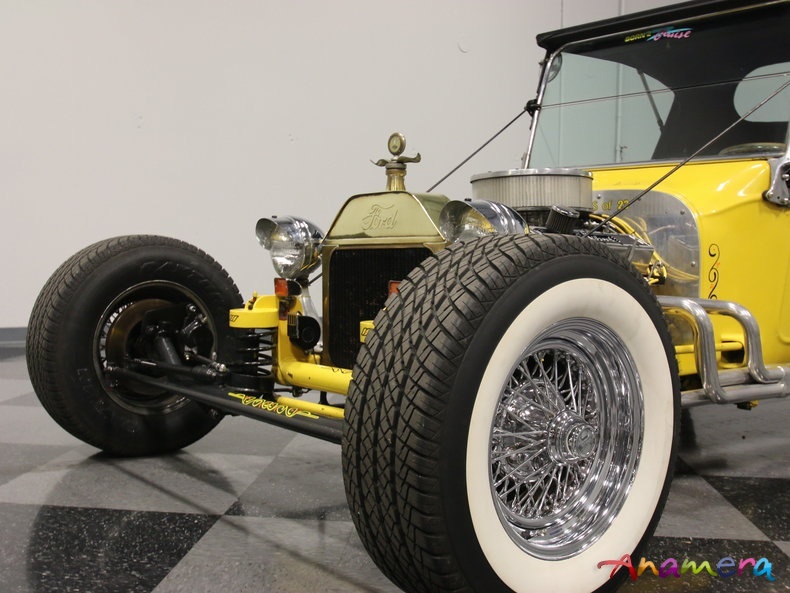 All the T-buckets are fiberglass these days, and this is no exception, and it absolutely nails that modified Model T look. 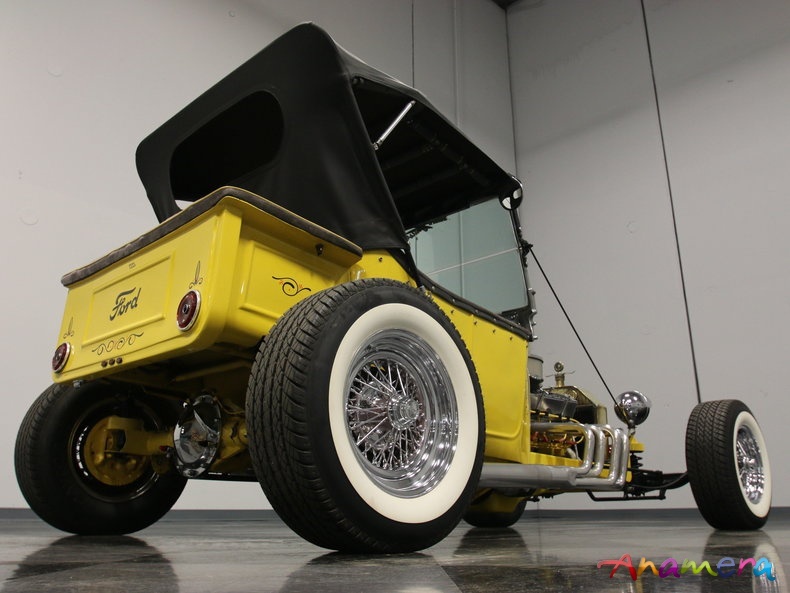 Finish quality is quite nice, and you really can't tell it's fantastic plastic until you knock your knuckles on it, and it captures all the detailing that the Model T offered, from the framed "tailgate" to the outline of a door on each side of the cab (there are no doors, of course). 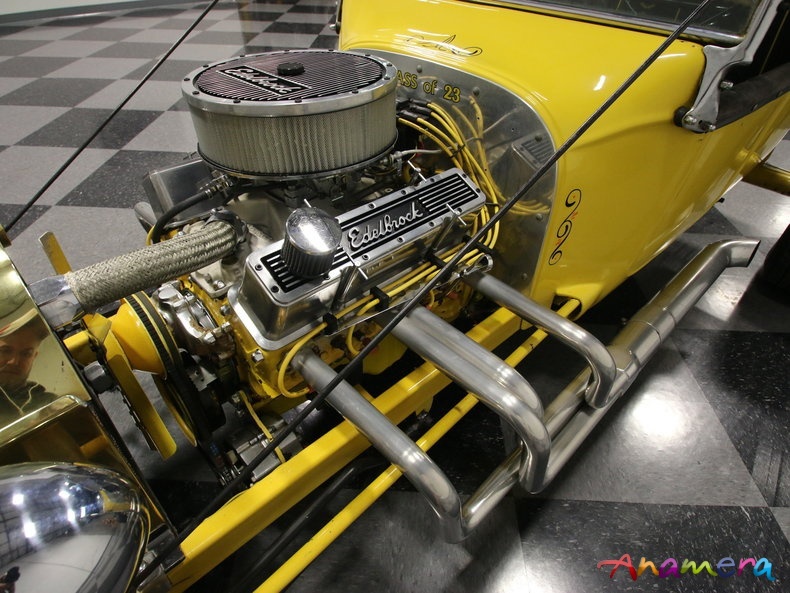 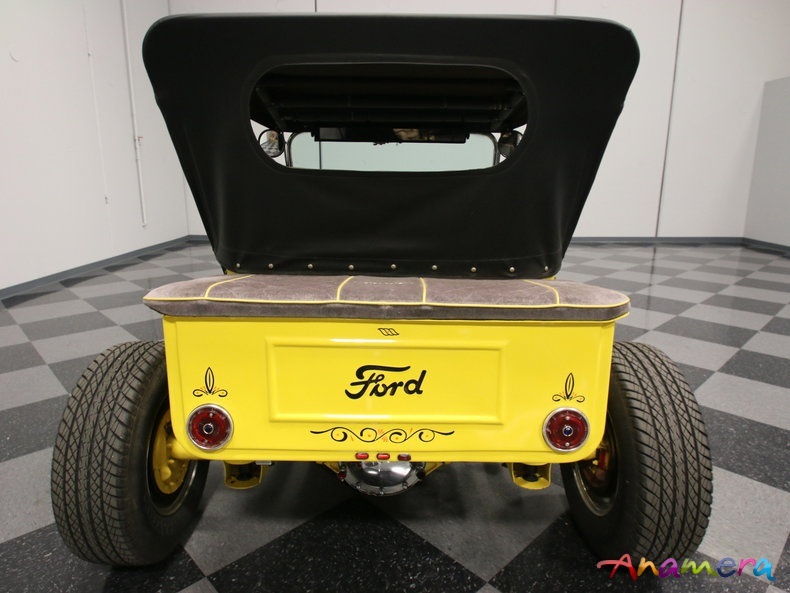 The bright yellow paint is perhaps the most striking element of the entire car, but the accents in basic black, including pinstripes and Ford script on the tail give it that vintage hot rod look T-buckets are famous for. 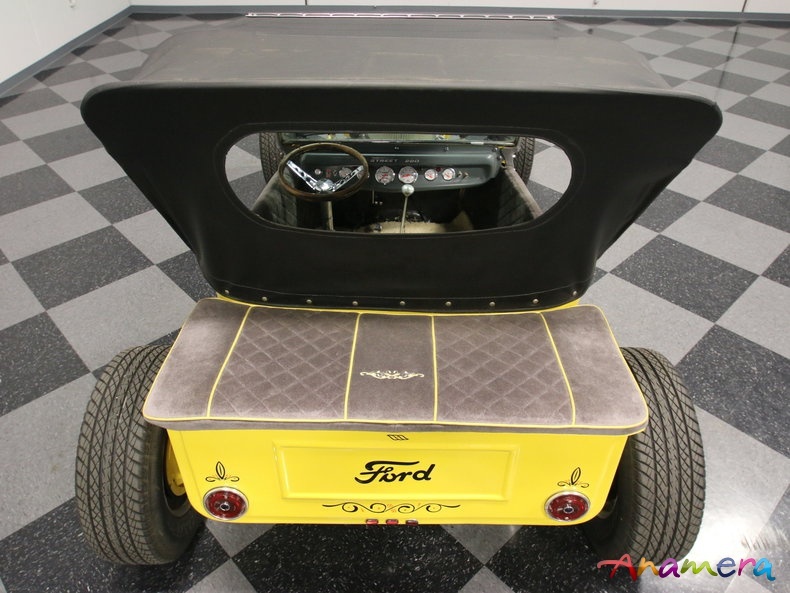 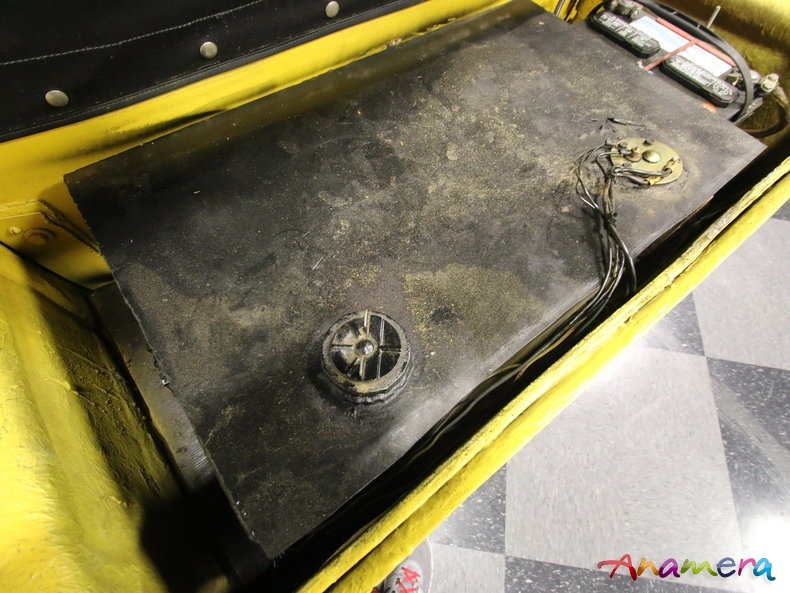 1950 Pontiac taillights, a brass Model T radiator shell, and King Bee headlights are all traditional pieces of the formula, but each car still seems to look different from the others, including this one. 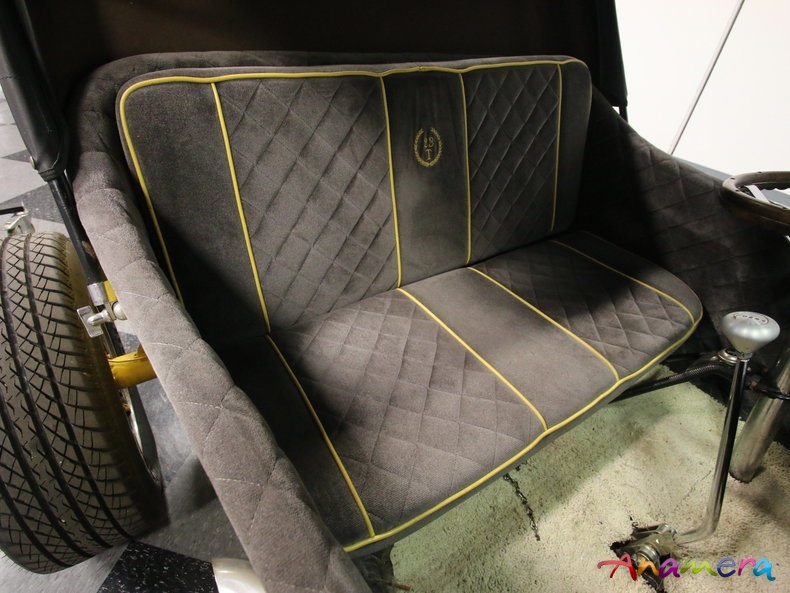 It's a driver, but you can tell it's been loved. 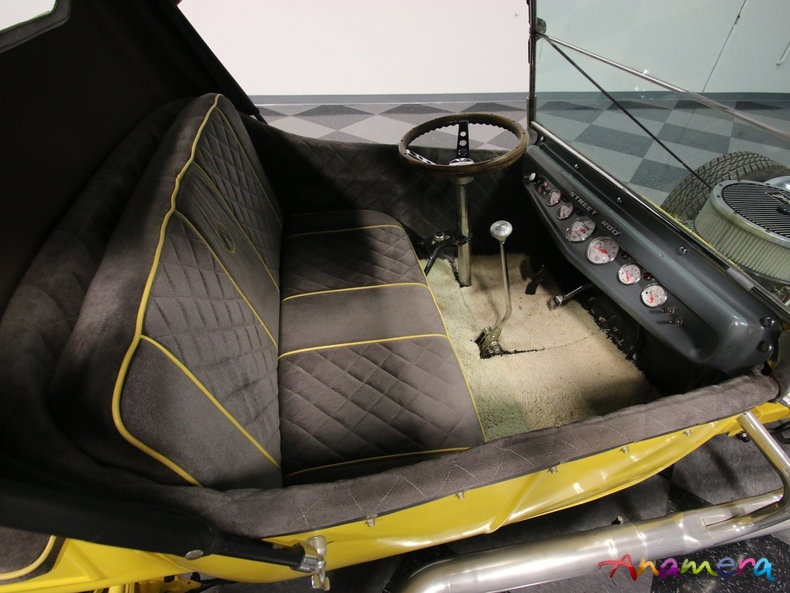 The interior is simple, but you'll probably appreciate the gray cloth upholstery when you're out for a cruise, because A/C is not available in a T-bucket. 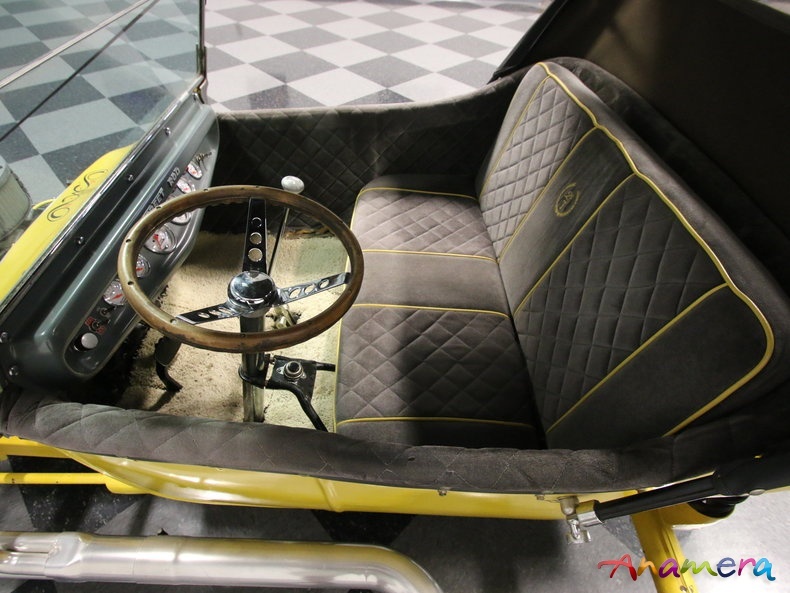 Strictly a 2-seater, the bench is neatly finished with diamond-tufted upholstery and yellow piping to tie it all together. 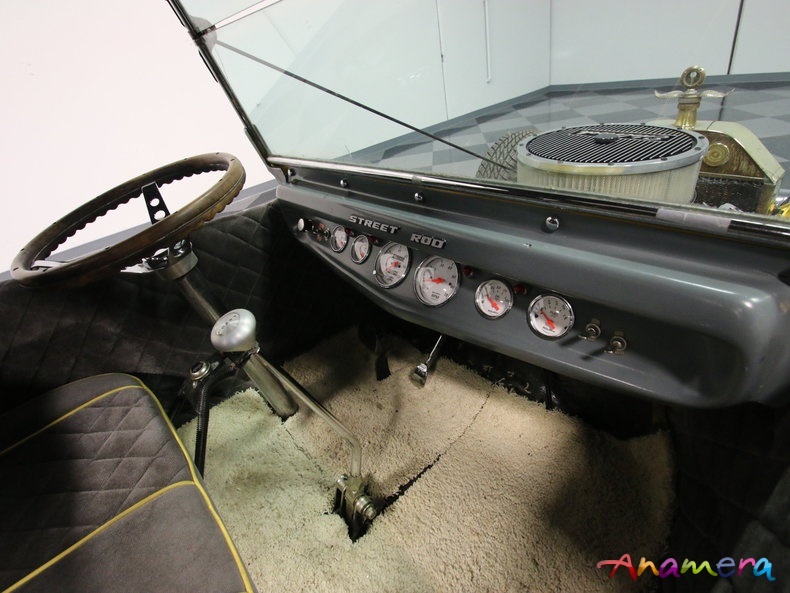 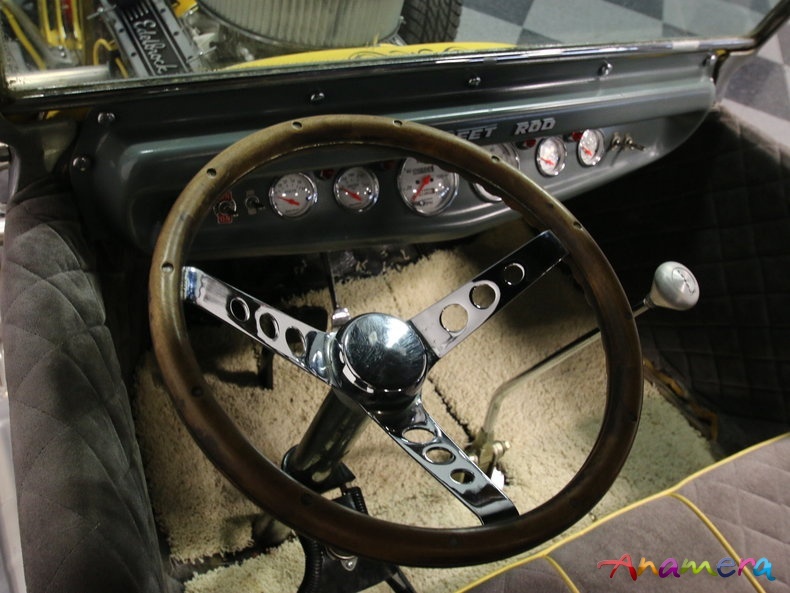 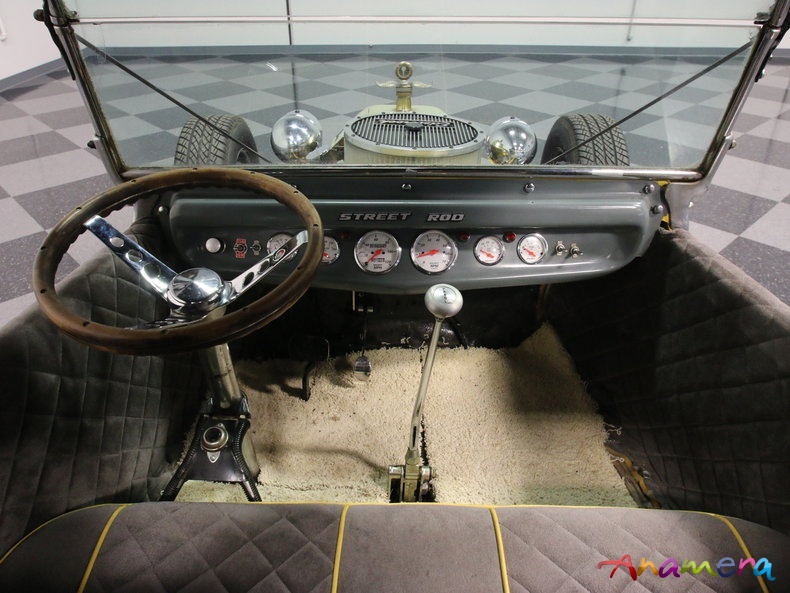 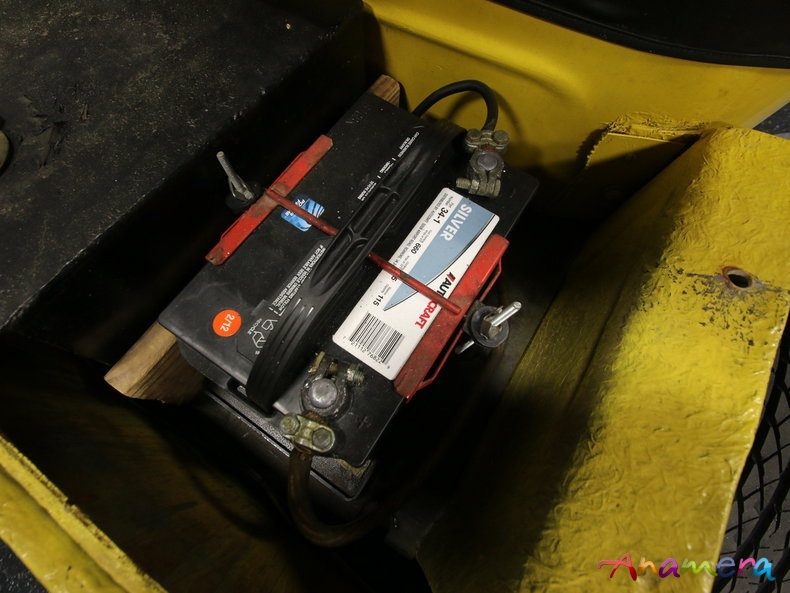 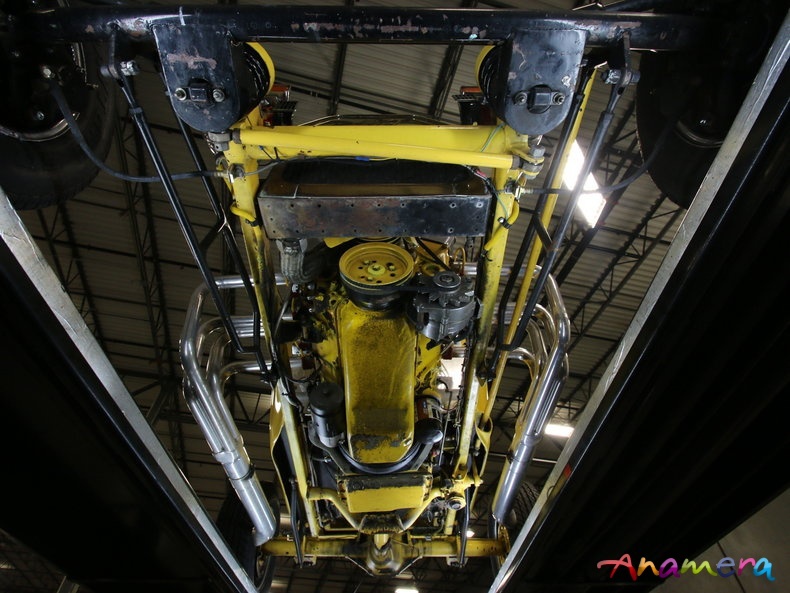 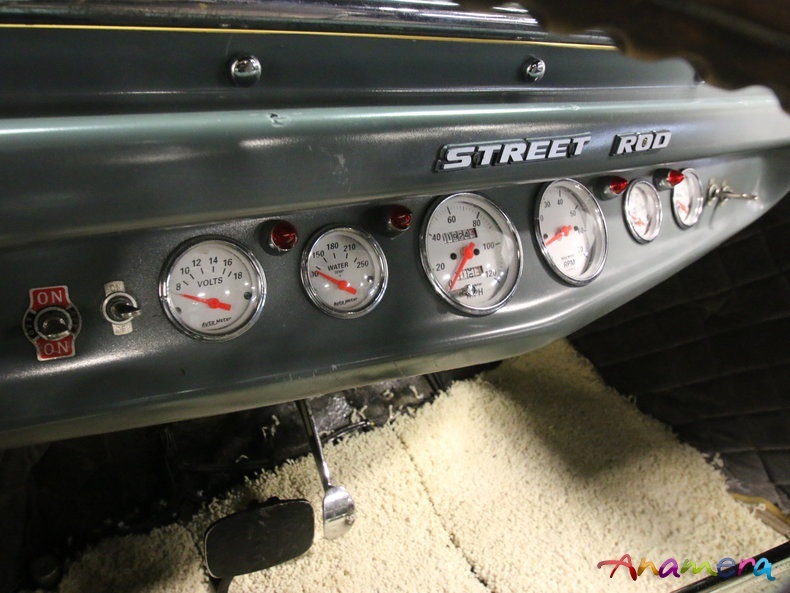 The upright steering column that is part of the T-bucket formula is topped by a wood-rimmed wheel, and bright white-faced Auto Meter gauges are spread across the dash. 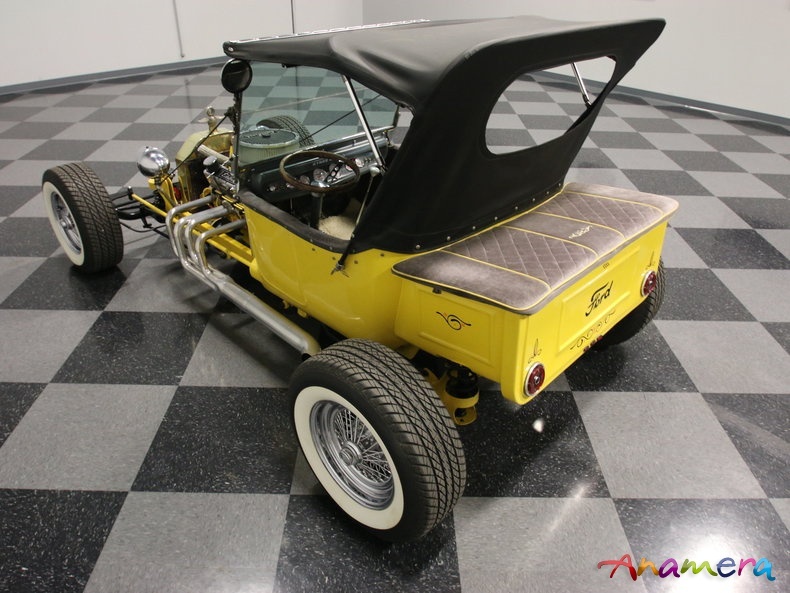 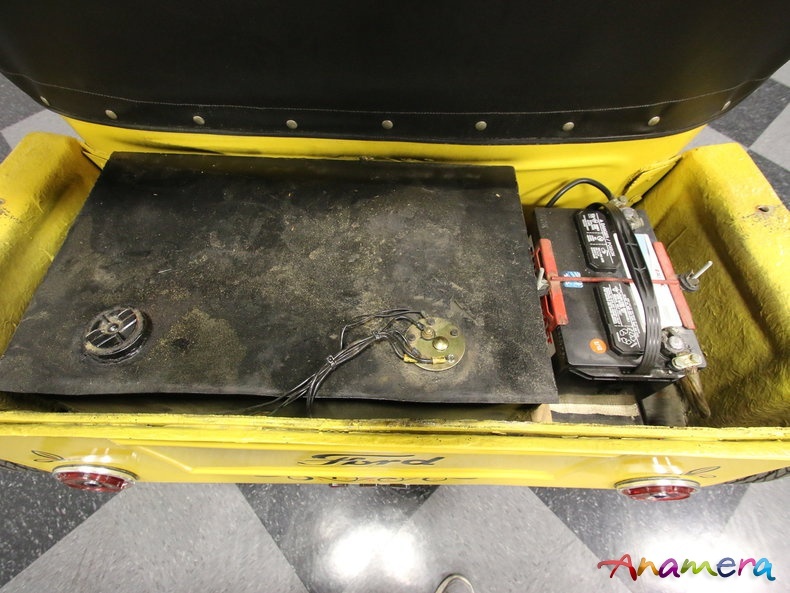 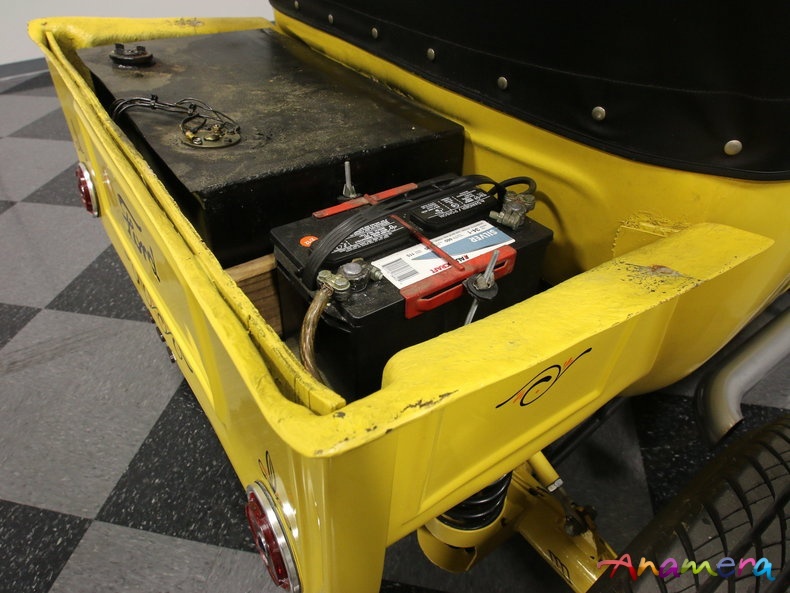 That tall black canvas convertible top is removable, creating the open-air T-bucket look, and the shrunken "bed" out back houses the gas tank. 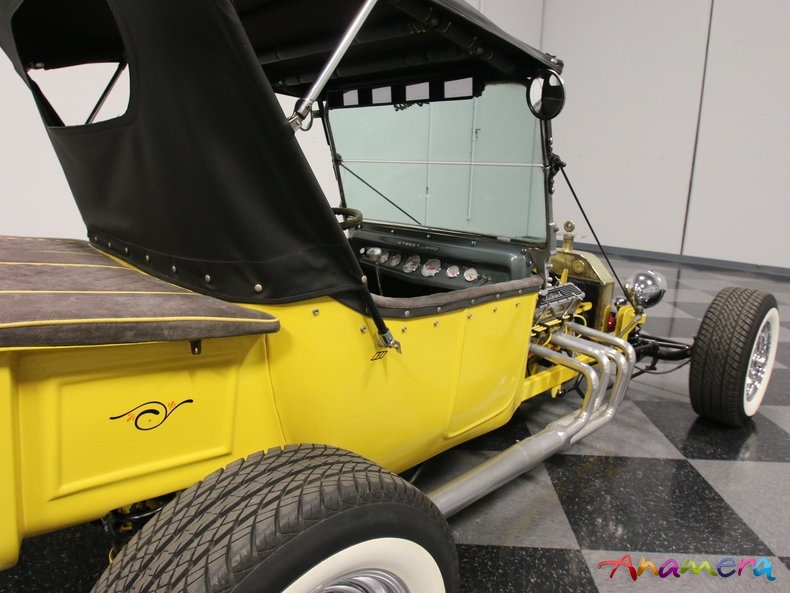 There's no radio, no heater, and, well, nothing but engine and the barest of minimums to operate it, and that's entirely the point. 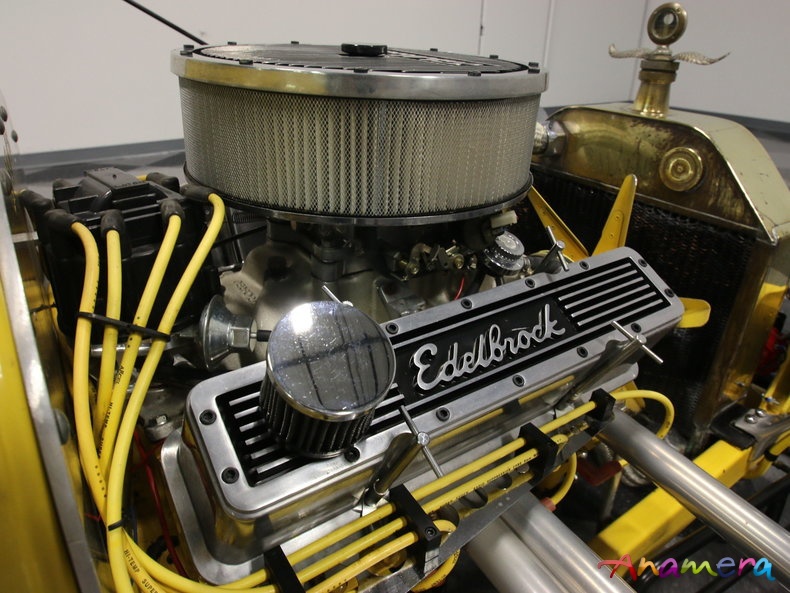 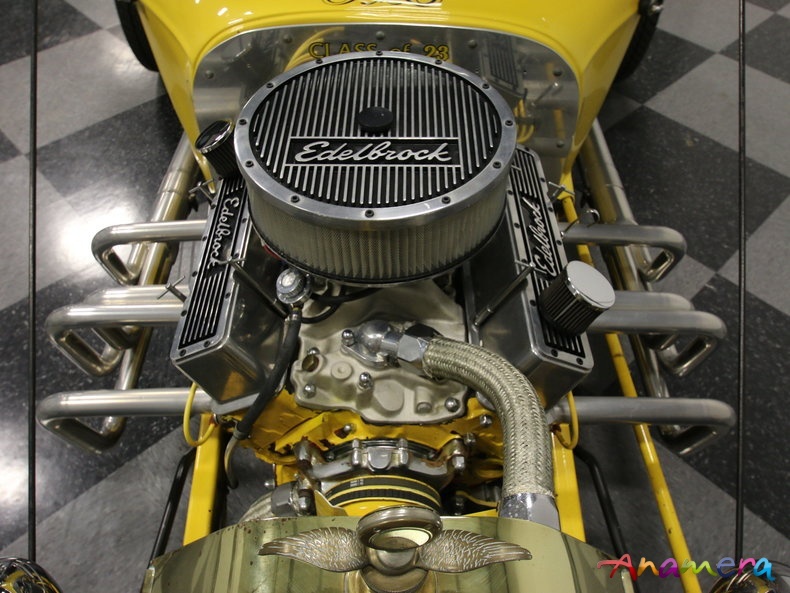 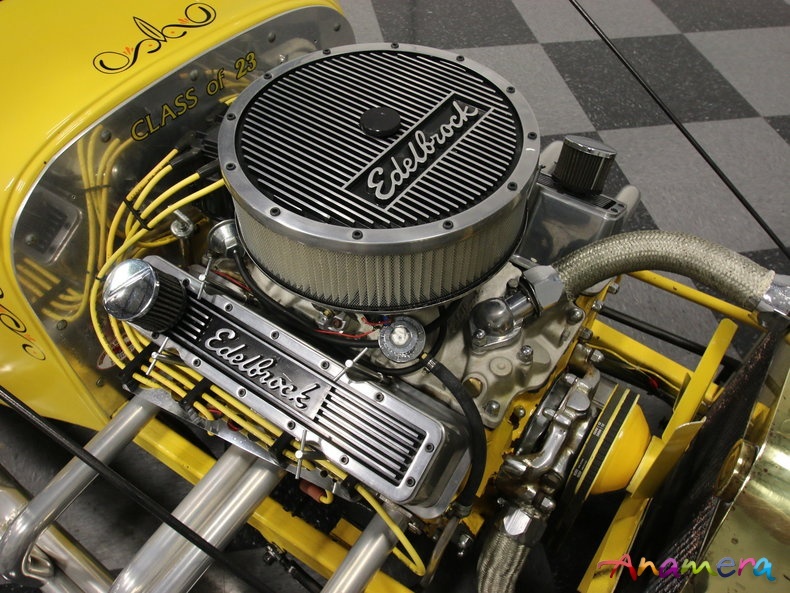 The engine is a chromed 350 cubic inch Chevy small block that's as much as styling element as powerplant. 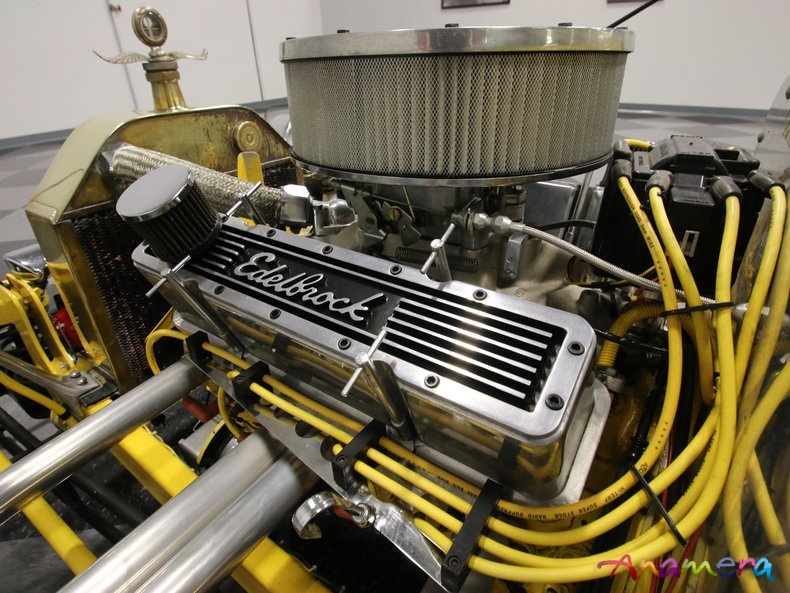 Dominated by an Edelbrock 4-barrel carb and those outrageous headers and side pipes, the look is instantly identifiable and the sucker runs extremely well. 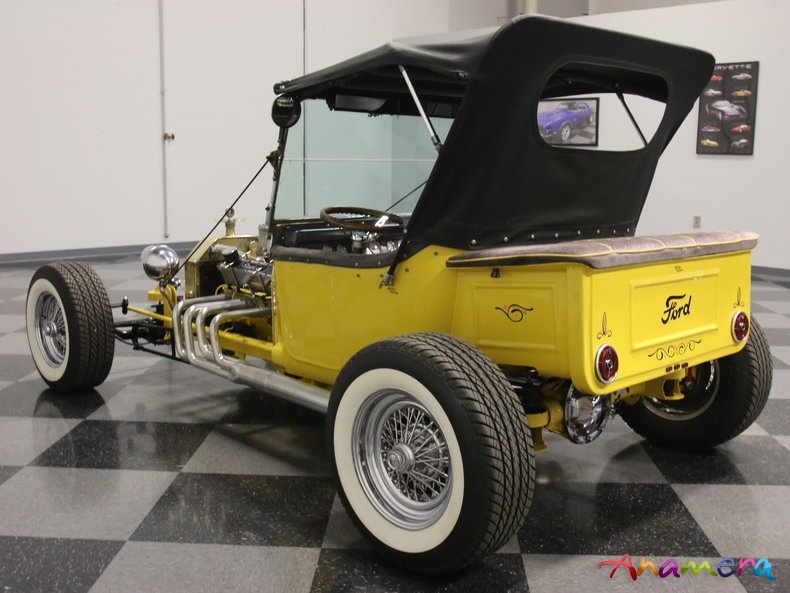 Fully sorted, it starts easily, idles well, and is happy to trundle through traffic without overheating thanks to a beefy radiator stuffed into that cut-down radiator shell. 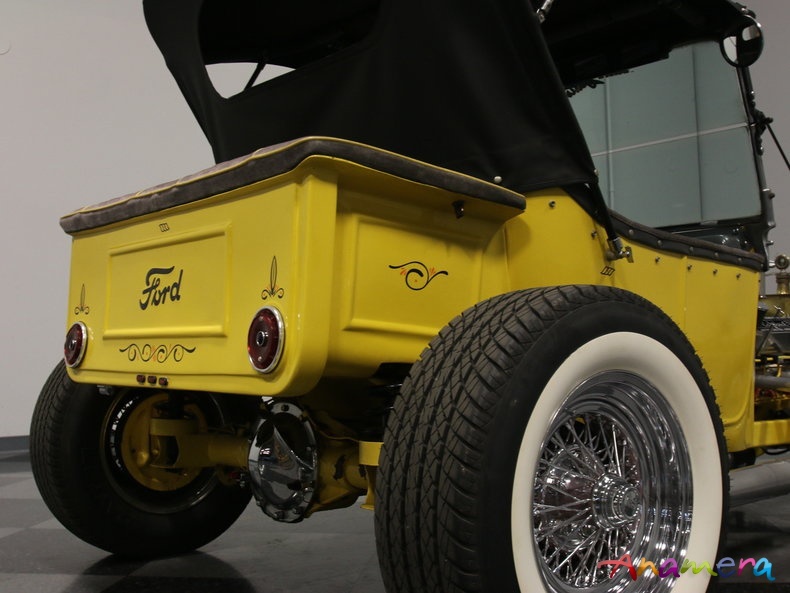 It's backed by a PowerGlide 2-speed automatic and a 10-bolt rear, which hangs from a 4-link setup. 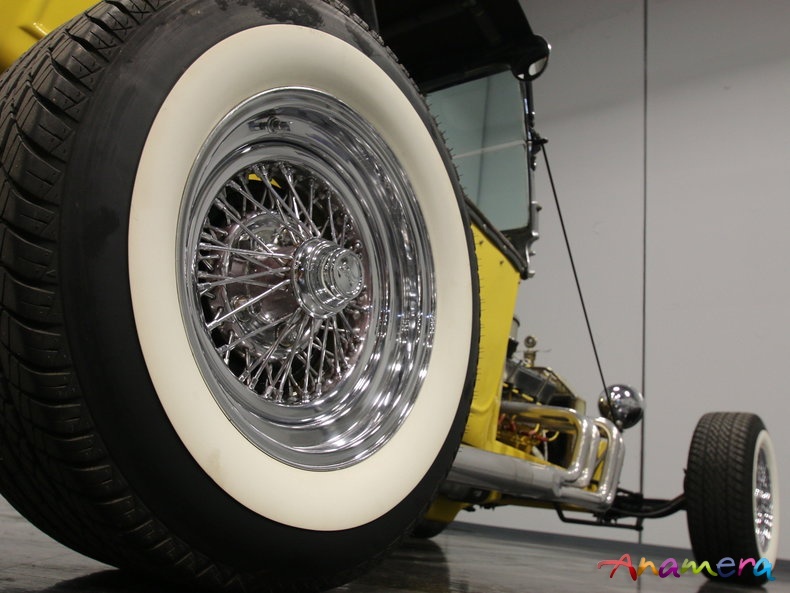 Up front, the traditional dropped axle on hairpins is one of the coolest features, since you can watch it working from the driver's seat. 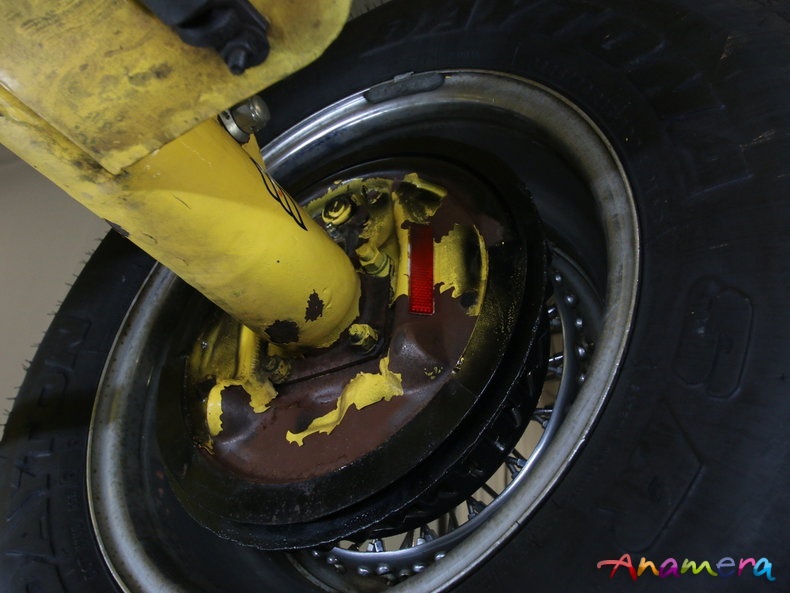 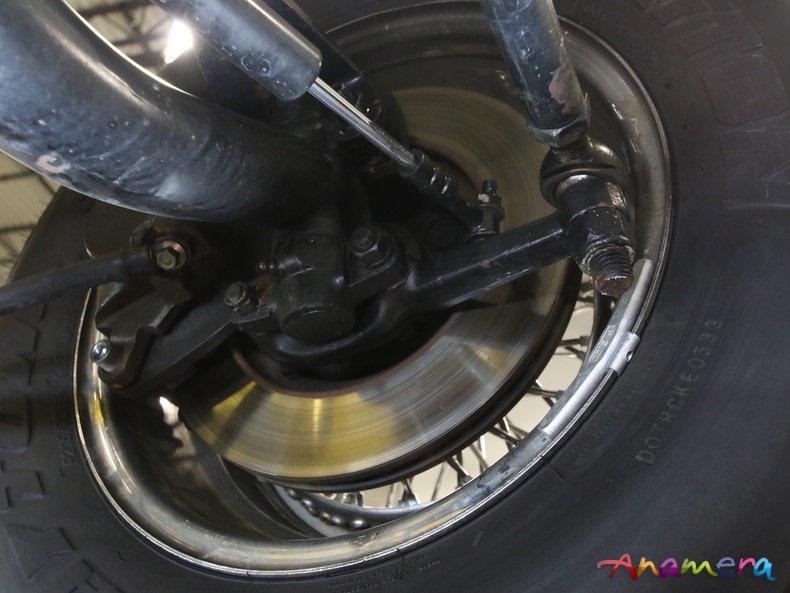 There are also front disc brakes grafted onto the tubular front axle, so it has impressive stopping power. 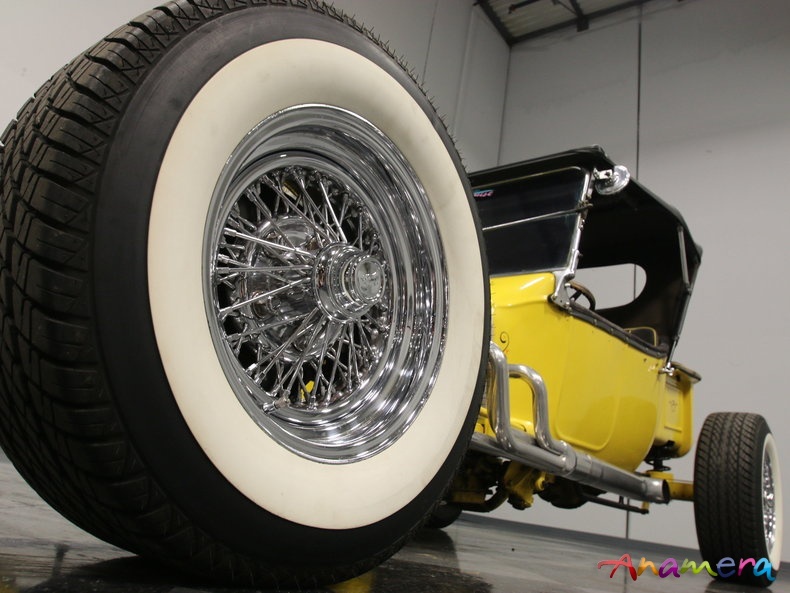 And while many T-buckets push the limits of tire, this one wears reasonably-sized 215/70/14 front and 225/70/15 whitewall radials on custom chrome wire wheels. 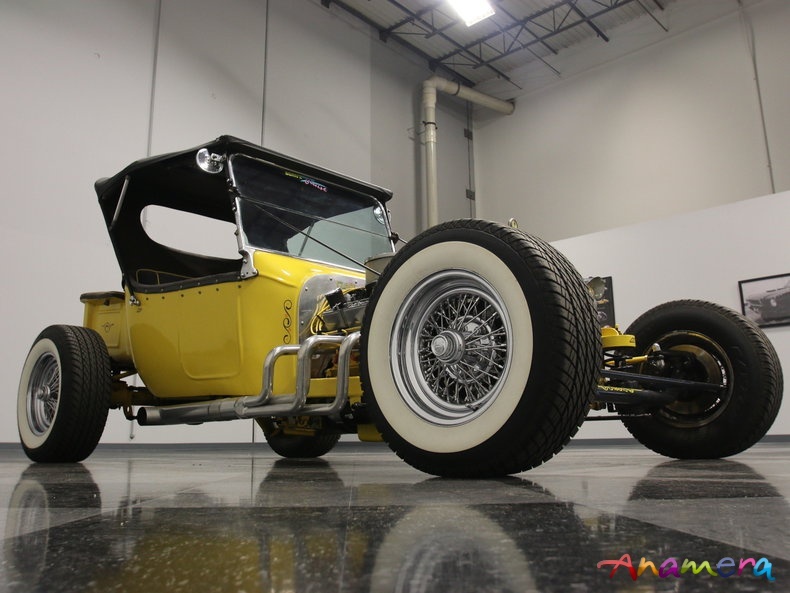 Is the T-bucket back? 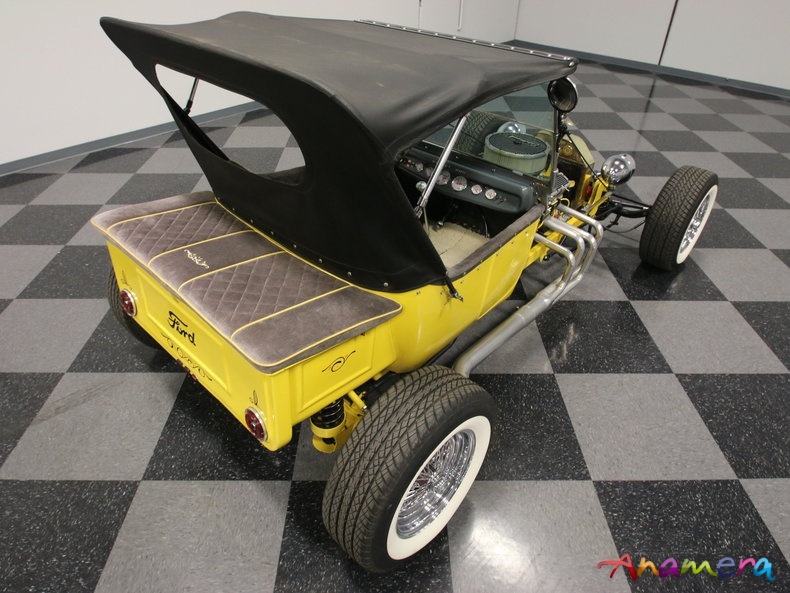 Given how easily they sell, there's clearly a large group of guys out there who still think they're cool. 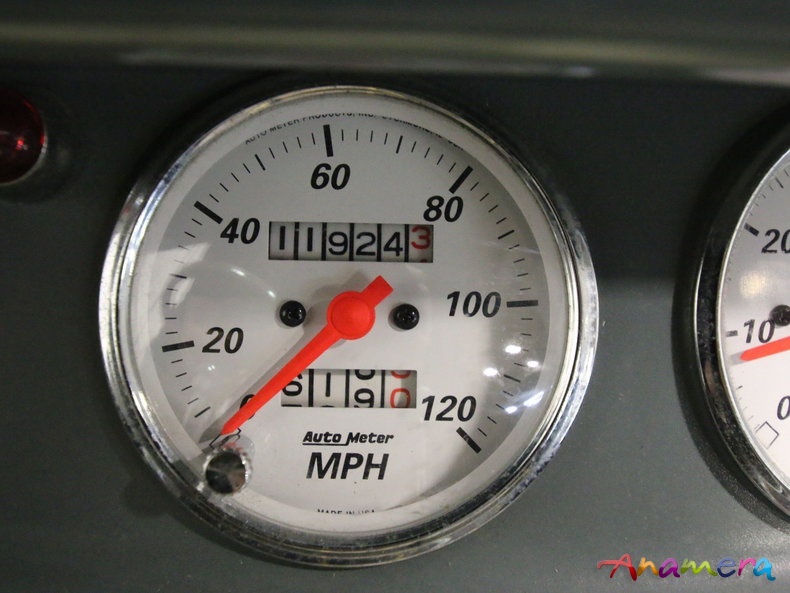 If you're one of them, give us a call today!